Top - CANGIARI STORE - Made in Goel s.c.s.p.a. Top There are 15 products. 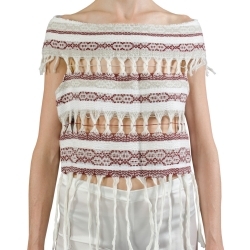 Organic Linen and Organic Cotton halterneck top with a front drape. 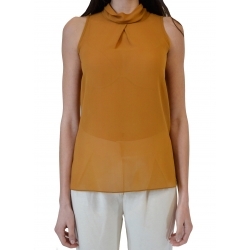 Organic Silk Georgette halterneck top with front drape. 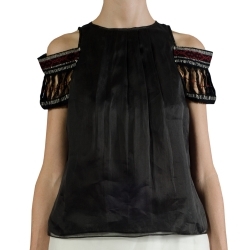 Organic Silk Georgette shirt, crossed laced closure. Organic cotton and silk sleeveless top. Pleated, it has a soft fit. It is characterized by an handwoven insert on the waist, with textures from Byzantine tradition. Crew neck and button closure at the back have handwoven stitches too. Made in Italy. Read more! 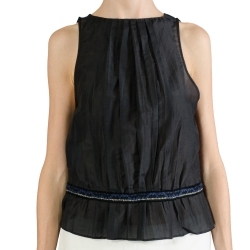 Organic organza sleeveless shirt. Its soft fit accentuates the transparency effect of the fabric. At the front, v-neck starts from Mandarin collar and finishes with button arrangement. This is hand-refined and links six handwoven inserts. Made in Italy. Read more! 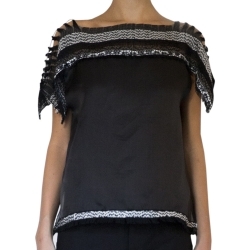 Organic organza top with a soft fit. Fraying patterns on the shoulders derives from the sliding of a weft wire among warp ones: they follow short batwing sleeves and make top special. They are inside an organic cotton and linen insert completely handwoven. Another one is on the fringed lower edge. Made in Italy. Read more! 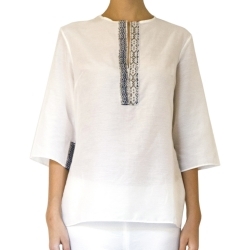 Organic cotton and silk tunic with a soft fit. At the front, a little v-neck starts from Mandarin collar: it is underlined by two handwoven inserts parallels to the button arrangement. Other inserts on kimono half-sleeves. Button closure is handwoven too. Made in Italy. Read more!